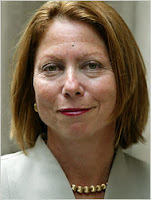 the nytpicker: Live-Blogging Jill Abramson: "You Would Have Preferred To Read A Partisan Hatchet Job. You Won't Find Those In The Times." Not to nitpick, but Limbaugh's show is on Premiere Radio Networks, not Fox. Thanks for the correction. Noted and fixed above.